Lebrecht is a strong proponent of performances of Mahler’s Tenth. Although completed in sketches, it was unfinished at the time of Mahler’s tragically early death in 1911, with the exception of the first movement which was orchestrated. Several other notable devotees of Mahler’s music have put their hand to completing Mahler’s symphony. For them, I suppose, it is too tantalizing not to attempt to realize the work and thus to have one more Mahler work. But many many notables have rejected the idea. Among those who were against completing or performing the unfinished symphony are Georg Solti, Otto Klemperer, Bruno Walter, Leonard Bernstein, Pierre Boulez, Michael Tilson Thomas, Raphael Kubelik, and Claudio Abbado. That’s quite a distinguished list! The argument rages over at Lebrecht’s blog page. I think about 20% of the respondents are against and 80% in favor. Those against make the point that Mahler was a known reviser, and probably was nowhere near completing even the music that had been orchestrated. He would have revised it considerably, they suggest. Leonard Bernstein made the assertion that Mahler would never have completed his 10th, because he said all that could be said in his 9th! Those in favor rush to point out that none of those who have worked to complete the symphony has every suggested their efforts are anything more than performance versions. Lebrecht himself says there is no excuse for ignoring the 10th. The Colorado MahlerFest performed the Wheeler realization, and our Artistic Director, Robert Olson, recorded it on Naxos. What do YOU think? Where do you stand and why? 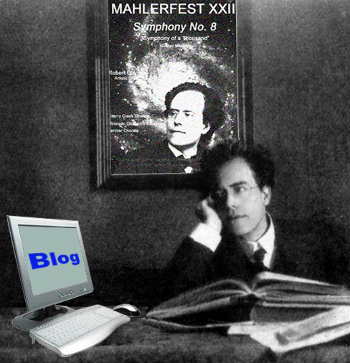 This entry was posted in Mahler's 10th, MahlerFest, News, Ron Nadel and tagged Colorado MahlerFest, Deryck Cooke, Georg Solti, Leonard Bernstein, Mahler, Mahler's 10th Symphony, Norman Lebrecht, Ron Nadel. Bookmark the permalink.